But, as I sat down to write this post I realized that as with many goals, it wasn’t that I failed but, that in the pursuit of it, the goal changed. I hated being tied down to having to try something new when sometimes what I really wanted was something familiar, and I found myself getting stressed out if it was one of those busy weeks when making a protein shake seemed too complicated and I was supposed to be finding a new vegetarian feast. I did however try a lot of great new recipes, some of which got blogged about here, here, here and here (Yes I know linking like that in a blog post goes against blog writing 101 rules…). More importantly my cooking became more creative and interesting because just the act of reading through my old books inspired and motivated me. So not a failure after all. To kick off year two of my cook(those)books challenge I thought I would tell you about a book that has had a huge workout recently. Especially given the short life span it has had on my shelf. It is stained, dog-eared and post-it noted and it is a testament that at least one goal of mine is going quite well. My promise to learn to can. Canning food has been going through a bit of a trendy resurgence lately. To that topic all I can say is “Mom, for all the years I thought you were tremendously uncool, let me now apologize. If preserving is cool and trendy. You were the trendiest. My teenage self stands corrected.” (she’s never going to let me forget this…). It is true. 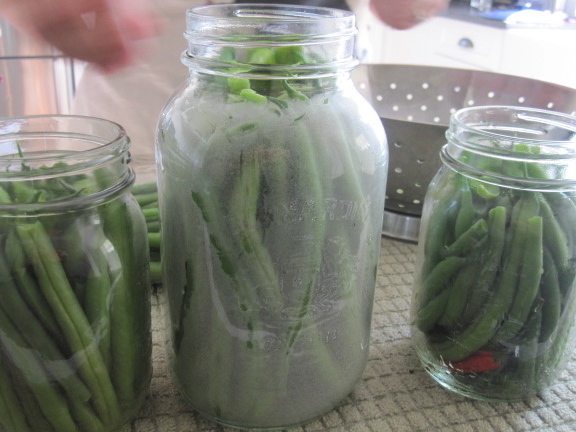 Growing up summer and fall were canning time in our house. The smell of vinegar oozed from our pores and every table surface would be covered with wooden boards and jar after jar of goodness. 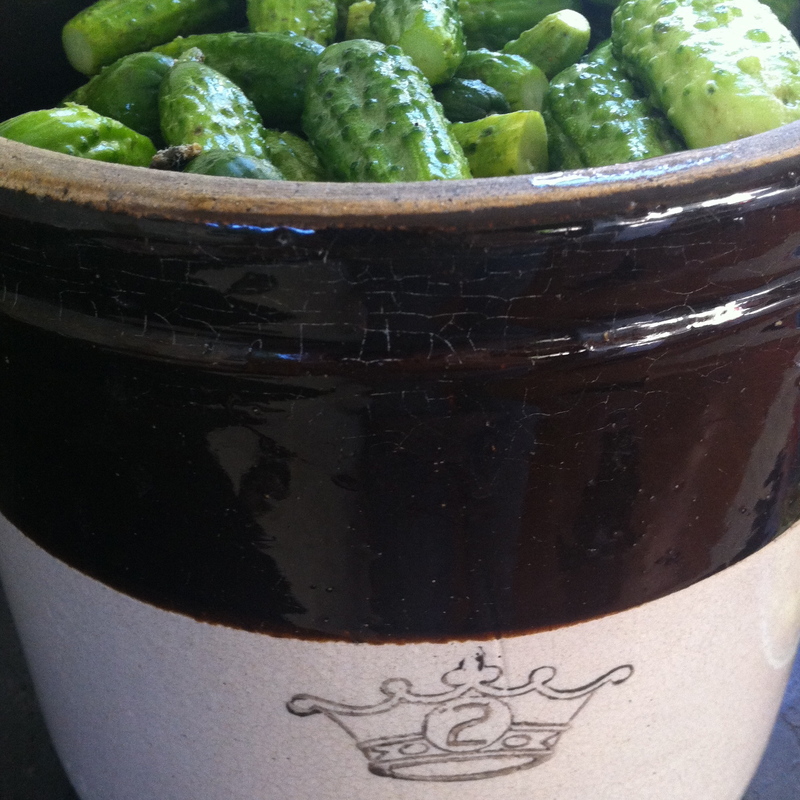 A year ago I tried pickling (without supervision!) for the first time. I mostly used recipes from my mother (and mother in law), and if I do say so myself, the few things I tried turned out quite well. This year I may, perhaps, have gone a bit overboard. But how could I help it? I blame it firmly on my new favourite book Food in Jars by Marisa McClellan. Like her blog the book is well written, down to earth and filled with modern takes on some classic favourites. To date I’ve made 14 recipes from the book including a beyond lovely spiced plum jam, insanely good peach salsa and and a blackberry jam with sage. As an added bonus there is even a bread recipe that takes me back to my teenage years when we used to take something similar on camping trips. So whether you are already trendy, or have set yourself the goal to see what all the fuss is about I strongly encourage you to visit your local bookstore and pick up a copy of her wonderful book. Here’s to another year of cooking (those) books. This entry was posted in Books, Cookbooks, Cooking, Food, Preserves and tagged cookbook by mostlynoodles. Bookmark the permalink. No prize necessary. Maybe your book could be my own personal Julie/Julia project – I could cook my way through the whole thing! 🙂 Seriously, it’s a great book. You should be incredibly proud.